become digitally literate, i.e., able to use, and express themselves and develop their ideas through ICT for the future workplace and as active participant in the digital world. To become a competent, confident, responsible and critical user of technology. To develop appropriate social skills that are essential for co-operative and collaborative learning. To take ownership of their own learning. Acquire knowledge and skills in using Information and Communication Technology (ICT) to accomplish tasks, communicate, and facilitate activities. Develop awareness of the developments and emerging issues concerning computing and society. Develop critical and analytical thinking skills for practical solutions. Develop creative skills for problem solving. Keeping in mind the above aims, the present series has been designed for providing a vast theoretical and practical knowledge of computers to the students. Each Key concept starts with an engaging introduction followed by an activity based approach to learning, which is supported with ample number of diagrams, pictures and relevant screenshots. This series covers the latest tools-Windows 7, MS-Office 2013, MS-Paint, Scratch programming, App development and a lot of knowledge of Internet that includes Email, Google Drive, Blogging, Podcasting, E-Commerce, Cloud Computing, etc., Web Support and Teacher’s Resource Books are available with the entire series. Key Concepts: Describes the goals required to be achieved by the end of the chapter. Activity/Do and Learn: Encourage the students to explore more information on the topics learnt. Now You Know: Summarizes the chapter. Key Terms: Some terms taught in the chapter that student should be aware of. Exercises: These contain, multiple choice questions, fill in the blanks, state true/ false, match the columns, answer the following questions, application based questions and crossword/puzzle based question. It contains both objective and subjective questions. Group Discussion: Encourages the students to have discussion on various topics for sharing their knowledge. Teacher’s Notes: Includes instructions for teachers that help them to make learning better. 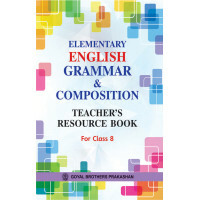 Teacher’s Resource Book: Contains teaching hints for explaining concepts and answers to the textbook exercises. Learning Environmental Education Class 4..